“Chittoe is a neat little chapel, built with brick, twenty-four feet by fifteen in the clear. The walls are eight feet high to the wall-plate, and ceiled up from the rafters so as to make it eleven feet from the floor to the ceiling. It has a boarded floor, and four sash windows, two on each side, four feet by two and a half. And instead of weights and pulleys, the top sash is fastened to the bottom one with brass hinges, so as to fall inside at pleasure, for the admission of air. The land was given by Mr. Breach, and the hawling was done by him and Mr. Miles, free of charge. The whole cost was seventy two pounds twelve shillings. Towards this was raised, by the collections at the foundation sermon, the opening services, and by private subscriptions, sixty pounds five shillings and eight-pence halfpenny ; leaving a debt upon the chapel of twelve pounds six shillings and three-pence halfpenny. There are no pews; but there are eleven seats with backs to them, all of which are let, and bring in quarterly about fourteen shillings and sixpence. In 1882, Major Spicer paid for the chapel to be moved and rebuilt at Chittoe Heath, apparently because the Methodist singing was very loud and enthusiastic and often interrupted the services in the neighbouring Anglican church. A schoolroom incorporating the original chapel foundation stone was added in 1914. During the 20th century a special feature of the chapel was Good Friday afternoon and evening services with a special tea in the schoolroom. 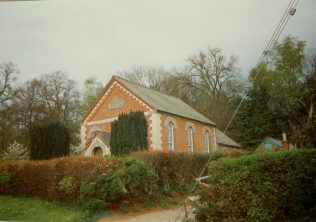 The chapel is still in use. There is a small graveyard at the chapel. The Wiltshire united Churches site maintains that Chittoe Heath Methodist Chapel was the original inspiration for the BBC radio programme called “The Chapel in the Valley” with Sandy Macpherson.